The conditions are improving in the mountains and we have been splitting our free days about 50-50 between SHED and snowboarding. Our current intentions of taking it slow and steady at the beginning have lead to well planned and efficient work days that tend to be in the 4-5 hour range due to chilly temperatures. The underside of our floor is our first defense against moisture, temperature, road debris, insects and rodents so we have taken a few precautions to try and ensure a reliable separation between the aforementioned risks and our interior. This started by gluing and screwing ½” plywood to the underside of our joists and then covering it with water proof paint. The last layer we added was a metal flashing nailed to the entire surface of our undercarriage with all of the overlapping seams taped with heavy duty flashing tape. Besides getting our trailer back from Portland safe and sound, this relatively small task really was our first success. 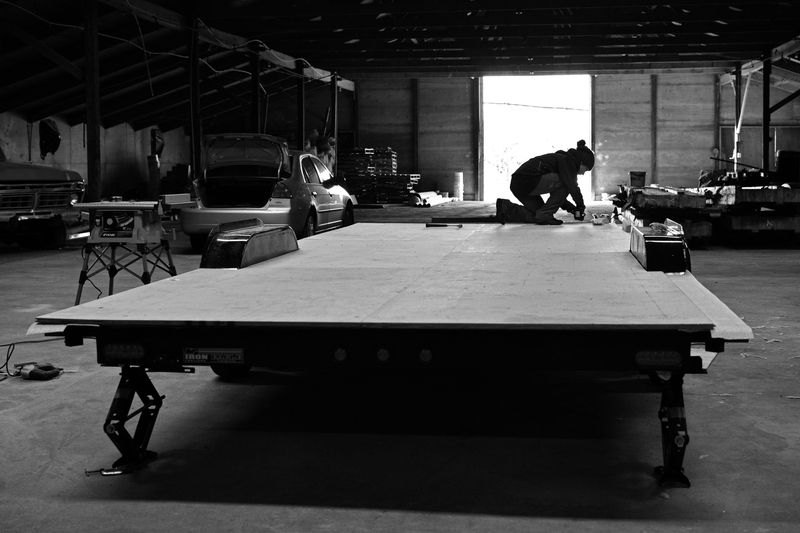 We had constructed an 8’ x 24’ floor box to only ¼” less than the trailer dimensions (to compensate for the sill gasket on each side) and no matter how many times we measured the width & length of our trailer there was certainly a bit of anxiety about it not fitting. In communal fashion we rounded up some friends with promise of beer, flipped the floor system over and gently set it in place. To our relief, our floor nestled in tightly and slowly slide down into the 6” deep cavity to become flush with the top of our trailer. 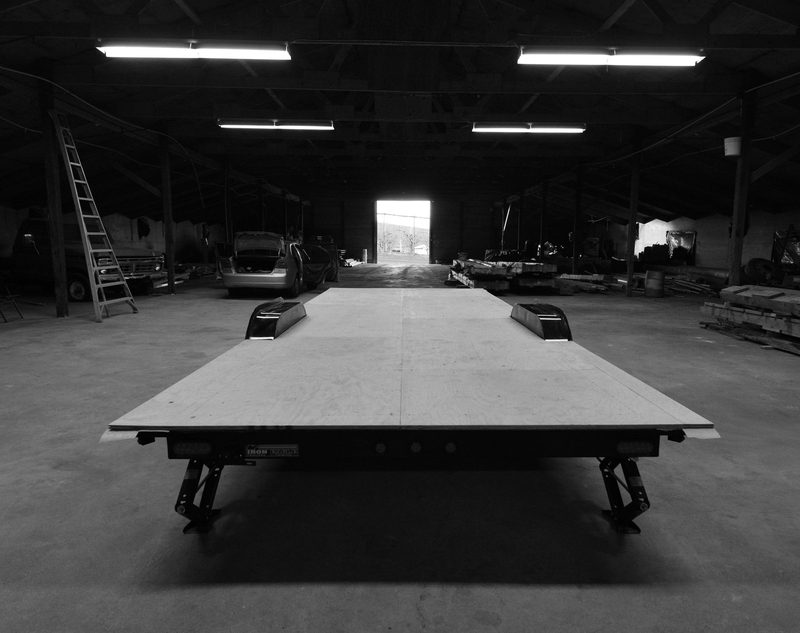 As one may assume, securing ones house to the actual trailer is of primary importance, especially because of the forces subjected on it during transportation. 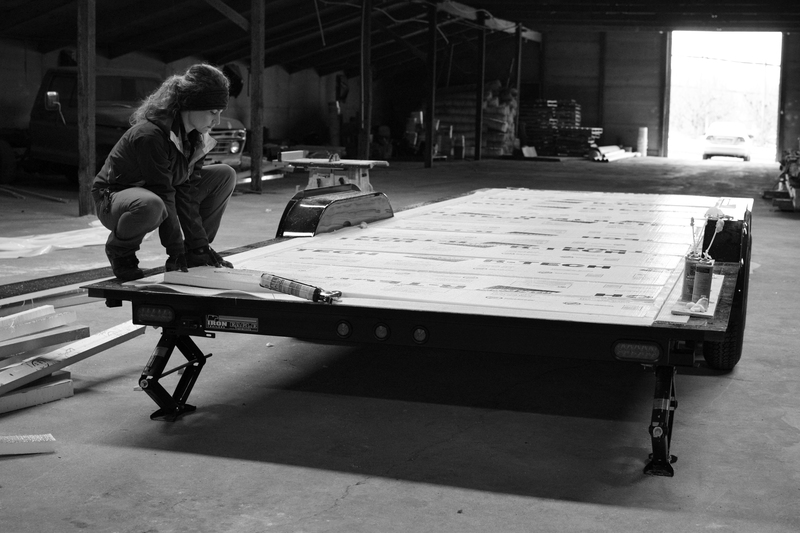 Our Iron Eagle Trailer was fabricated with (10) 5/8” holes on each side wall for this reason. I made my first trip ever to Tacoma Screw and began to learn what a valuable resource they may become as I walked out with (20) 5/8” x 4.5” zinc plated bolts, washers, and nuts for almost 30% less than the big box store. A simple 5/8” paddle bit did the work of drilling the 20 holes and Samantha placed a bead of silicon down beneath the washers before inserting and tightening the hardware. We had intentions of first checking to see if our intended material purchase would fit in our friends truck but by the time he pulled into the Home Depot parking lot Samantha and I were standing at the loading door with two flatbed carts stacked with material up to our heads, with the receipt in my hand. This round of materials provided us with enough rigid board insulation and T&G plywood subfloor to fill and cover our entire floor system and set us back over $600.00! There has got to be a cheaper way, maybe with a little more planning and foresight. Whole sale? Thanks for helping load, transport and unload our goods, Graham! On our way to the project site to insulate our subfloor we made the (seemingly) obligatory stop at Home Depot to get those extendable razor blade utility knifes (that are good for cutting through thick foam) and left with a table saw. Yep, we bought a portable table saw to cut foam. To be honest though, I had been considering this idea for a few days and at $200.00 we felt the (impulse) purchase was justified. After using it, we stand by that decision. It took us close to a quarter of the expected time to fully insulate our floor system and we were able to do it with a much higher accuracy. 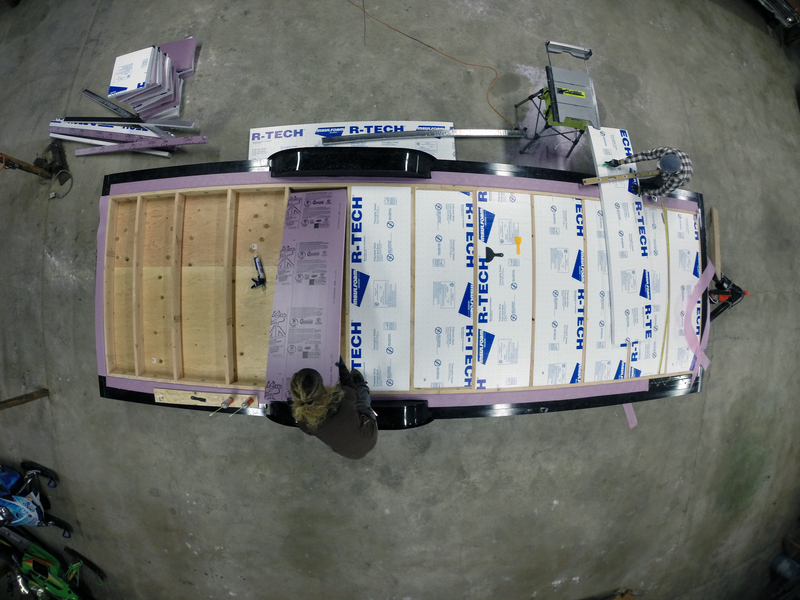 We could cut perfectly straight slabs of rigid foam board that fit very tight against the surrounding joists and helped nearly eliminate any chance of gaps for air or moisture caused by trying to cut long straight lines with a utility blade. This is far less than 1/2 of the insulation work this project will require in addition to a lot of plywood sheathing and miscellaneous rip cutting of materials so we are feeling good about our little Ryobi table saw’s future use. In one final effort to completely seal up our floor we used great stuff spray foam around the joist perimeter and used a caulk sealant on the single seam between the plywood undercarriage (which is also painted, flashed, and taped on the other side) before placing the foam sheets in-between the joists. The last step was to enclose our tiny house floor like a time capsule and be left with a legitimate surface to begin building vertical. We did so with ¾” tongue and groove plywood spanning perpendicular and glued and screwed to the joists. In a matter of 3 hours we completed a killer [portable dance] floor. This is a natural milestone in the construction process and we are pretty much ready to start building vertical. However, in order to start framing walls we will need to finalize our window and door sizes and locations. So in the coming weeks we will have to do one more round to check out the local bone yard* window piles and dive back into the drawings and make some decisions before placing an order for windows and lumber. We will be taking some time to head north and explore Whistler Blackcomb ski resort in British Columbia with some great friends of ours. I need to start studying for my already scheduled and fast approaching architectural licensure exams! Our bank account needs to catch up. *A bone yard pile is often found at lumber yards and/or window dealers and is often contains a stash of mix matched windows of various sizes, colors and materials that have been returned, cosmetically damaged or were part of a over –order/mis-order. If you can find windows that you can use in your design they are often extremely cheap or even donated. Keep an eye out in the near future for another video compilation followed by some non-construction posts as we navigate the next stages and make some final decisions on the design and detailing of our wall system so we can start building vertical! Let us know if you have questions that we don’t answer in our posts. It is sometimes difficult to navigate that area tucked between overly detailed / mundane and too vague / confusing. I see that you are using a combination of Owens Corning Foamular 150 and R-Tech Insulfoam. Is there a specific reason for combining the two unique products rather than going with just one of those? Thanks! It came down to price and weight. When comparing the two insulations The Owens Corning 150 has a bit higher R-value and is denser as well as more expensive ($32.00 per sheet). The R-tech Insulfoam was lighter and cheaper ($22.00 per sheet) so we decided to try having the best of both options while keeping the cost down as much as possible. What we did was have the bottom layer, or the first layer of insulation defense to be the 2″ sheet of R-10 dense pink Owens Corning 150. Once placed in tight between the joists the surrounding seams were sealed with spray foam. The Owens Corning also seemed like the heartiest insulation when it came to resisting moisture should it some how get though the flashing, paint & plywood layers of the undercarriage. Now that we felt like we had a solid moisture, air, and initial temperature defense laid down we filled the remaining 3.5″ of the cavity with the lighter and cheaper 2″ and 1.5″ thick sheets of R-tech Insulfoam on top. Because of the rather deep insulation cavity (5.5″) compared to other elements of the house we felt the slight drop in R-value would not have a noticeable impact. As always, time will tell. One of the reasons a project like this is so educational is that you get to experience the consequences (both positive and negative) of your design and construction choices first hand once you begin living in it. I always find other tiny house builders retrospective thoughts about “what we love and what we hate” or “what we would do differently”are the most interesting and informative posts. So if for some reason we regret this decision, we will let you know (a year+ from now!). Was there any reason you didn’t have Iron Eagle Trailers install the flashing for you? Also, you used the 1/2″ plywood on both the top and the bottom of the sub-floor? Is that necessary, or did that make it easier to install your own flashing? To our knowledge IET did not (does not?) install trailer flashing. 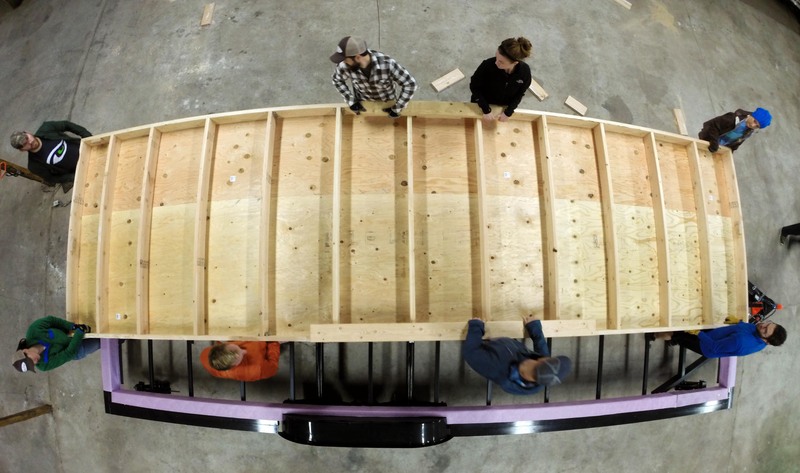 Because it is a 6″ trailer cavity we needed the 1/2″ plywood to bring our 2×6 floor assembly up to flush with the trailer deck at which point we covered the entire deck with 3/4″ t&g plywood. While we would have gone with out the plywood if the depth of the cavity was only 5.5″ we do feel good about the added rigidity and protection the painted plywood offers. It also provided a great substructure to flash to and helped out immensely with the way we did our plumbing drainage thanks to the firm surfaces on both topside and underside of the floor that we put holes through. Thank you so much for this detail. 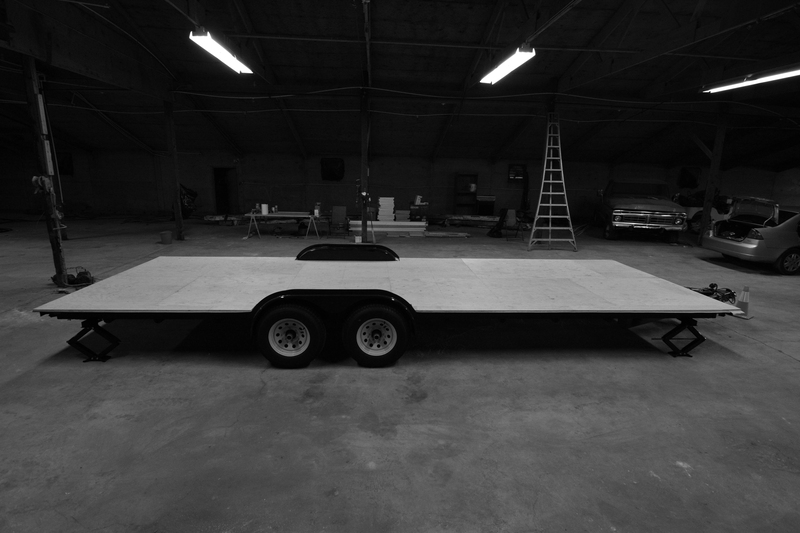 I am awaiting the delivery of my trailer and am anxious to know everything I can. Obviously this is not possible and I am guessing I will have to wait until the trailer arrives before I know exactly how things are going to unfold. Your methods here have offered me a good insight. thanks.